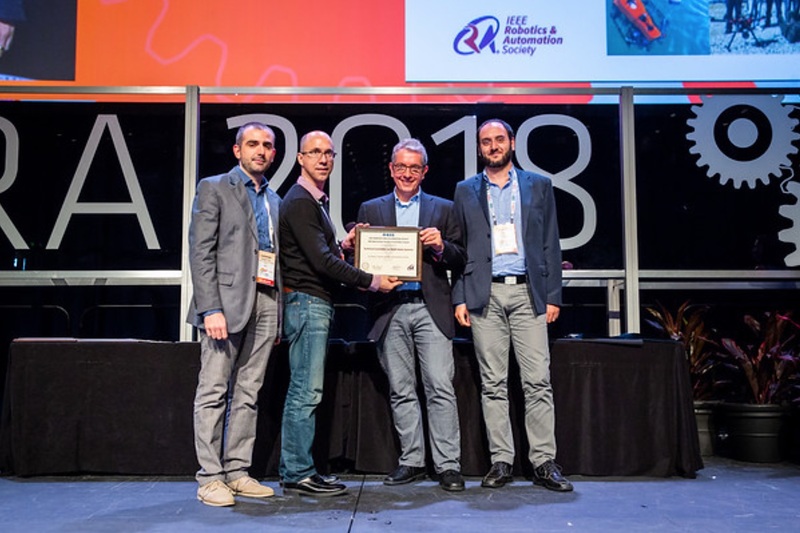 Antonio Franchi (CNRS researcher in the RIS team) is the recipient of the 2018 RAS Most Active Technical Committee Award for his service as co-chair of the Technical Committee (TC) on Multi-Robot Systems of the IEEE Robotics and Automation Society (RAS). The award has been officially delivered by the President of the IEEE RAS, Wolfram Burgard, on May 24th 2018 in Brisbane, Australia, at the 2018 IEEE ICRA conference, the flagship IEEE conference on robotics hosting more than 3000 participants. The IEEE RA Society counts more than 40 TC’s. Each TC is led by a small number of co-chairs (typically 3 or 4). The main role of a TC is to initiate, promote, and disseminate technical and scientific activities around a particular area of the Robotics and Automation domain. The award is given every year by a highly qualified committee of IEEE RAS to the TC which distinguishes itself in quality, number, and effectiveness of scientific and technical initiatives. just to mention some of the activities. The technical committee website is hosted by LAAS and managed by Antonio Franchi. This virtual place represents at date a fundamental hub for the interaction and dissemination of the worldwide research and innovation activities on multiple robot systems.